Aztec Electronic control with adjustable speed control. Pulse Function allows a quick start/stop control. 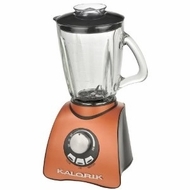 Features:LED indicators / brushed aluminum body/ detachable stainless steel blade With 6 blades for ice crushing/ ice and smoothie functions with graduated glass jar (1-1/2 litre capacity). Removable filter cap for easy filling/ safety lock/ non-slip feet/ high-quality rubber lid.